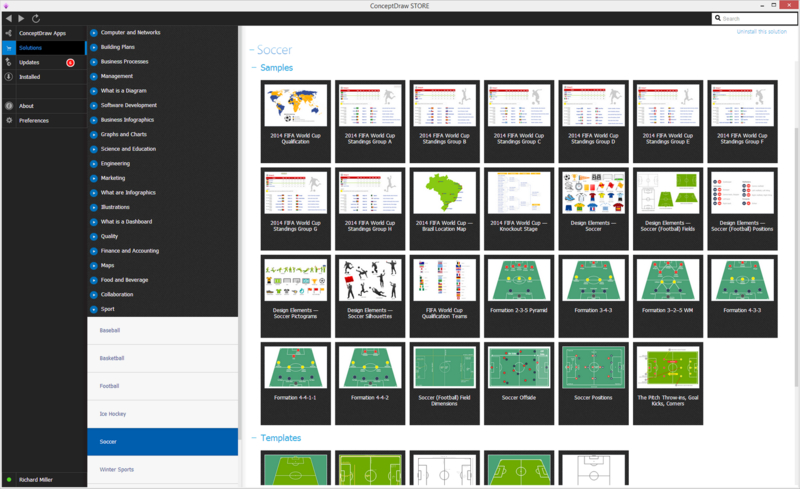 Creating the soccer field plan mentioning different positions, such as the offside one, is always possible to do within a very short period of time as long as you have ConceptDraw DIAGRAM software and the Soccer solution from ConceptDraw STORE application. Offside is simply one of the laws of the association football, which was codified in the 11th Law of the general “Laws of the Game” book. The law is known to be stating that a player is in an offside position in case he or she receives the ball, played forwards by a teammate, who is known to be actively involved in the particular play. No player can be offside in case they are behind or level with the ball while it is being played. A player is known to be in an offside position in case her or his body parts with which he/she can touch the ball during any other part of the play are in the opponents' half of the football field, being closer to the opponents' goal line to compare to the both second-to-last opponent and the ball. Being in an offside position shouldn’t be treated as an offence in itself. At the very moment when the ball touches, or it is played by the player's team, that particular player is expected to be actively involved in the play (as the referee thinks) leading to an offence to occur. Once the so called “offside offence” occurs, the referee can stop the play and award a so called indirect free kick all the way to the defending team from the very same position where the offending player stands. The offside offence is known to be neither a “misconduct” nor a “foul”. The football players are never known to be sent off or booked for the offside. Any play occurred straight after there was an offence but before the referee can stop the play is known to be nullified. All the soccer players continuing such play may be booked, which can be based on the referee's assessment of how intentional or significant the play was. One of the most popular duties of the assistant referees is to be able to assist the referee in the adjudicating offside. The position on the so called “side-lines” can give a more useful view sideways across the pitch. All the assistant referees can communicate agreeing on an offside offence being occurred in a way of raising their signal flags. Regardless of the position, there is known to be no offside offence in case a player receives the ball directly from a corner kick, a so called “throw-in” or a goal kick. But the offside offences may occur in case a player receives the ball from either an indirect or direct free kick. An offside offence happens when a soccer player in an offside mongo at the moment the ball is played or touched by a teammate. But it is very important to take into consideration in such situation that it can be only committed an offside offence in case 1) the player becomes actively involved in play by touching or playing the ball which was touched or passed by a team-mate, 2) the player is preventing his opponent from being able to play or from playing the ball in a way of challenging an opponent for the ball or obstructing the opponent’s line of vision, 3) the player is playing a ball which is deflected or rebounds to him off the crossbar, his opponent or goalpost from an offside position. Any offside is known to be judged at the time the ball is played or touched by a teammate, but not when the player receives the ball, as it is possible for a player to receive the ball past the last opponent or the second-to-last opponent with no need of committing an offence. Thus, the process of determining if a player is in so called "active play" or not can be sometimes quite complex. The restart for an offside sanction is known to be a so called “indirect free kick” for the opponent at the place where the offence occurred itself. An assistant referee can always signal to show that an offside offence took place by, first of all, raising his flag upright without any movements and, secondly, by raising his flag in a manner that can signify the location of the offence, such as when his flag is pointed at a forty-five-degree angle downwards it means that the offence has occurred in the third of the pitch which is nearest to the assistant referee; in case his flag is parallel to the ground, then it means that the offence has occurred in the middle third of the pitch and if his flag pointed at a forty-five-degree angle upwards, then it becomes obvious that the offence has occurred in the third of the pitch, which is furthest from the assistant of the referee. Trying to judge whether a soccer player is level with an opponent at the moment the ball is kicked is known to be a hard work as in case a defender and an attacker are known to be running in the opposite directions, then they can be only two metres apart in less than one second. Some of the researchers believe that the so called “offside officiating errors” are "optically inevitable". The mentioned statement has been argued that technological media as well as people are incapable of detecting an offside position quickly and accurately enough to make the right decision. From time to time it is simply impossible to keep all the relevant players in the visual field at the very same moment, that’s why it’s always better to have such processes automated. No matter how hard the referee tried to spot the offside, there’s always a risk of the false judgement, which is being increased by the so called “foreshortening effect”, known to be occurring when the distance between the assistant referee and the attacking player differs a lot from the distance to the defending player. It can also happen in case the assistant referee is not in line with the defender himself. The well-known difficulty of the so called “offside officiating” is also often underestimated by the spectators. 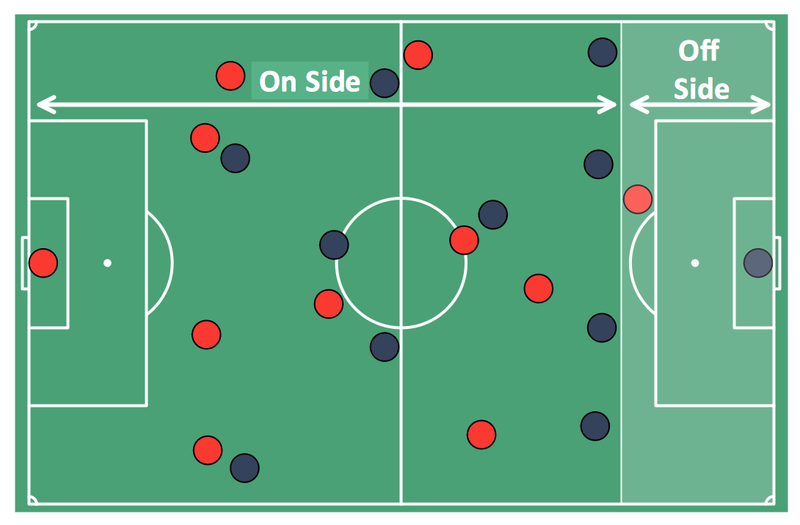 Nevertheless, if the offside was already spotted, it can always be illustrated in a way of a soccer-related diagrams as well as other schemas of any complexity within only a few minutes as long as you have so useful Soccer solution.